Rancho Mirage, CA (September 2017) – Rancho Mirage Marketplace, a shopping center operated by Westar Associates, recently completed a yearlong project of landscape upgrades. The center, anchored by Gelson’s Market, is located on the corner of Bob Hope & Gerald Ford Drive in Rancho Mirage. The project consisted of converting 30,964 square feet of grass to water-saving, desert-friendly landscaping, revitalizing an existing courtyard area, and installing a decorative gate enclosure for the Coachella Valley Water District lift station equipment. It was designed by RGA Landscape Architects, Inc. based in Palm Desert and constructed by Teserra Landscape Contractors based in Coachella. Through participation in the Coachella Valley Water District Turf Rebate program, the project included replacing grass with Hickory Creek Cobble Rock and the installation of colorful flowering shrubs, new plants, and trees. This conversion of grass to desert friendly planting will save an estimated 30% on water usage. The new landscaping incorporates a variety of flowering plants including Ixora, Dallas Red Lantana, and Tacoma, while keeping the existing Date Palms and Mesquite Trees, which provide a mature look to the plantings. Large fractured cobble and Hickory Creek Boulders in varied rust and gray tones, were set up in the medians and mounded for screening. These items, along with ¾” gravel, provide added texture and interest to the area around the shrubs and a more detailed design than mere decomposed granite. 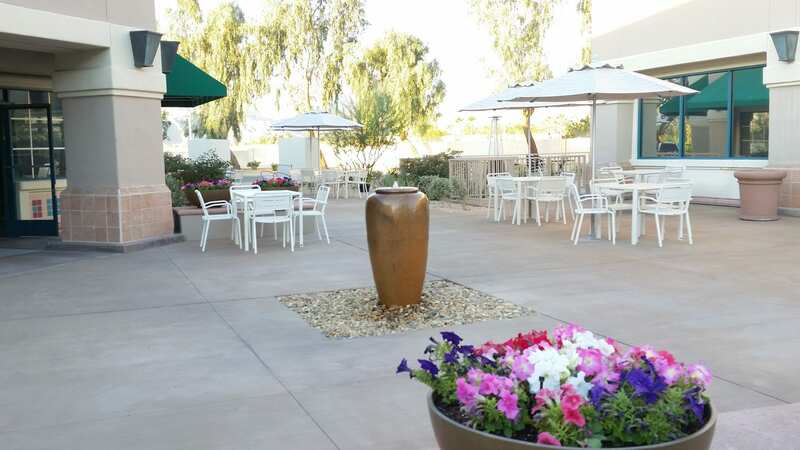 The existing courtyard, located on the west end of the center, was revitalized with stone bench seating, a new fountain feature, improved lighting, and added patio furniture to enhance the ambiance of the property. The large shade structure, which impeded western views, was removed to create a more open design that provides shade and a sense of enclosure using Palo Verde Trees and a low hedge of Xylosma to screen the adjacent parking lot. Rancho Mirage Marketplace is located at 36101 Bob Hope Drive in Rancho Mirage. The center includes Gelson’s Market, Chevron Gas Station, Chase Bank, and a variety of other service businesses and restaurants.